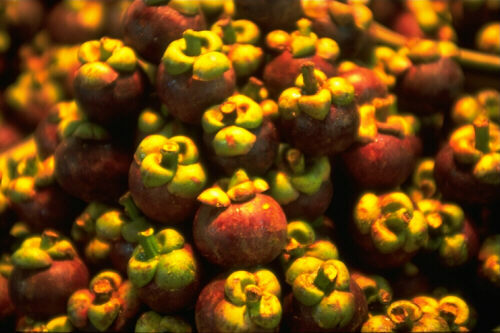 The mangosteen is perhaps the most delicate of all Thai fruits. Thais revere the hyper-aggressive durian as the "King of Fruits," and name the ineffably subtle mangosteen as the "queen." The fruit takes the form of a dark purple sphere with thick, waxy sepals surrounding a short length of stem on top. The bottom of the fruit bears a flat, raised, asterisk-like ornament. The number of points on this little star indicates the number of sections in the fruit inside. To eat the mangosteen, a sharp knife is used to open the rind and expose a snow-white sphere inside that separates easily into sections. Alternately, the top and bottom can be twisted in opposite directions; the thick but somewhat brittle rind splits easily. The juicy pulp is sweet with a slight sour edge, and has a fragrance that some compare to strawberries. Although there are canned mangosteens on the market, they bear little resemblance to the fresh fruit. Ideally, mangosteens should be eaten as soon as they have been opened.